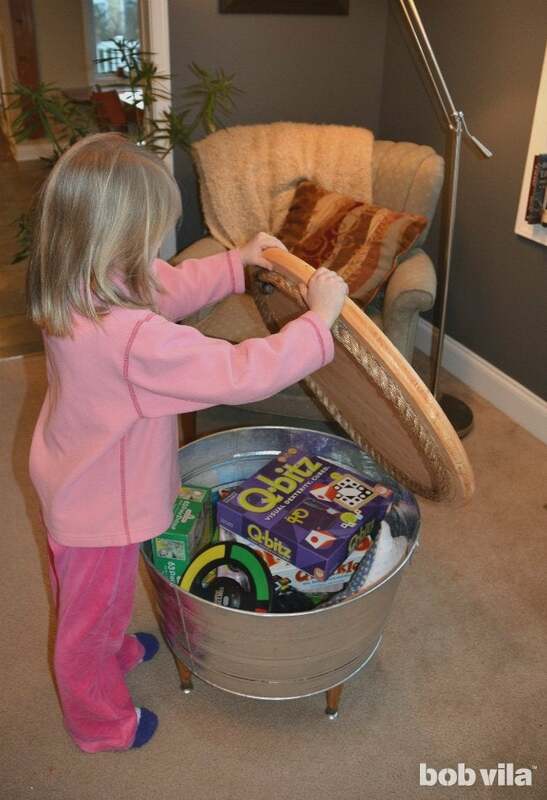 Keep your family's toys and games contained in a storage table that looks nothing like your standard toy chest. This stylish design blends in so well with your living room or library decor that no one will be the wiser. 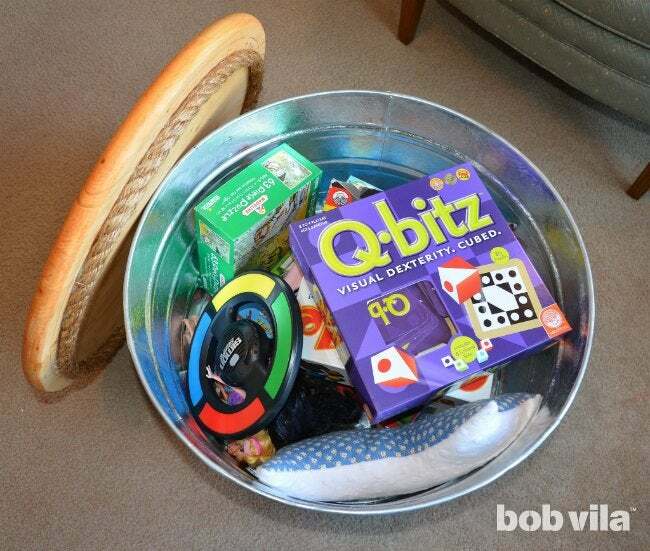 The holidays always bring a fresh influx of toys, games, and craft sets into the home. Come January, we struggle with where to put it all! On top of all that, we recently converted our playroom into a family office for both homework and household business. We needed a spot to store all those new playthings, something that would work in this repurposed space—a toy box that wouldn’t look out of place in a study. So we built a super-simple toy storage chest out of a galvanized tin tub, a prefabricated tabletop, and short furniture legs. Not only does this piece store toys and games, but it also doubles (even triples and quadruples!) as a coffee table, laptop perch, and footrest. To make your own sneaky toy storage, follow the simple instructions below. The construction of this project relies on a couple of basic, prefabricated supplies and is very easy. The only power tool you need is a drill! To even out any nicks on your prefabricated tabletop and ensure the best final finish, give it several rounds of sanding. Start with a coarse, 80-grit sandpaper, then switch to a 150-grit sheet, and finish with a fine, 220-grit. (You can use a palm sander to quickly cover the large surface area, or stick with sheets here.) Also sand down any wooden furniture legs you plan to attach. Thoroughly wipe down the wood with a damp cloth to remove all residual dust and allow it to dry. 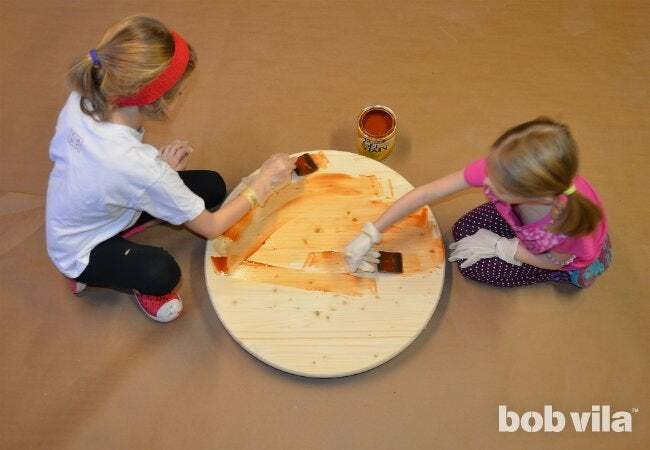 We stained our tabletop with a gel stain, which is much thicker than its liquid counterparts and therefore more forgiving when applied by beginner DIYers. Stir the gel stain very well before you start; when ready, it should have the consistency of very thick gravy. Then spread the stain with your foam brushes, working in the direction of the wood grain. After you’ve finished staining, apply polyurethane to seal and protect the finish. Either an aerosol spray or brush-on polyurethane works well. Let the wood dry completely before moving on with the rest of the project. 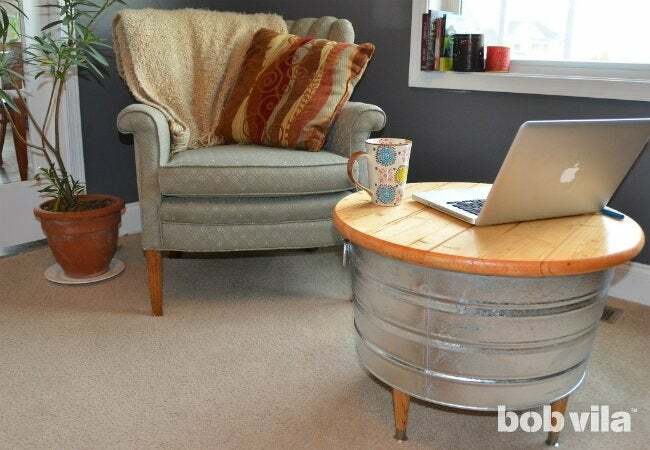 To keep the tabletop securely on the tub, you’ll want to attach a lip. We solved this by creating a seal out of thick rope! 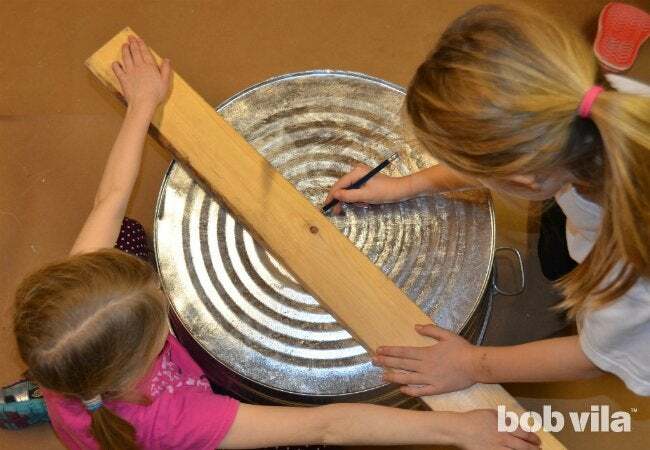 Determine exactly where to glue yours by turning the tub top-down onto the underside of the wood top and tracing its outline with a pencil. 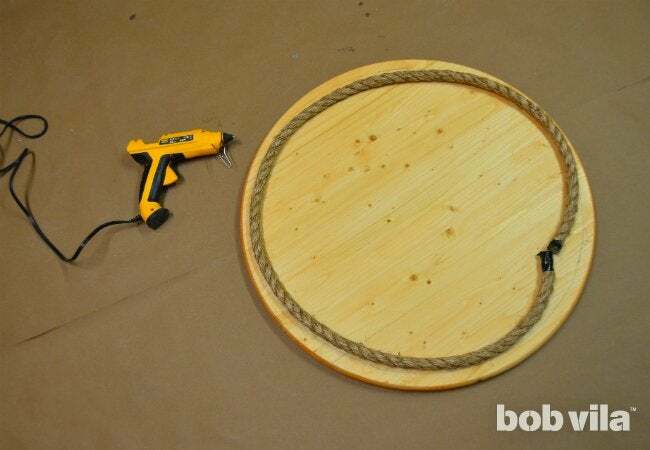 Next, hot-glue the rope about 3/4 to 1 inch inside of that pencil line, along the entire circle. 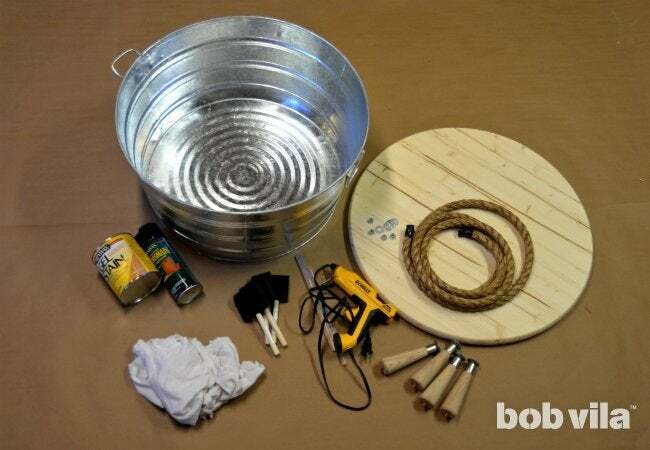 That ring will sit inside the tub once you replace the top, keeping the wooden round from sliding about. You could be finished right now…or you could attach some legs to make your table a little taller. If you’re up for the latter, turn your tub upside down and use a straightedge to draw a pencil line directly across the center of the tub bottom, marking the diameter. Make a second line through the center at a 90-degree angle to the first line. Then, mark about 1 1/2 to 2 inches from the edge at each end of those pencil lines to guide the placement of your four table legs. 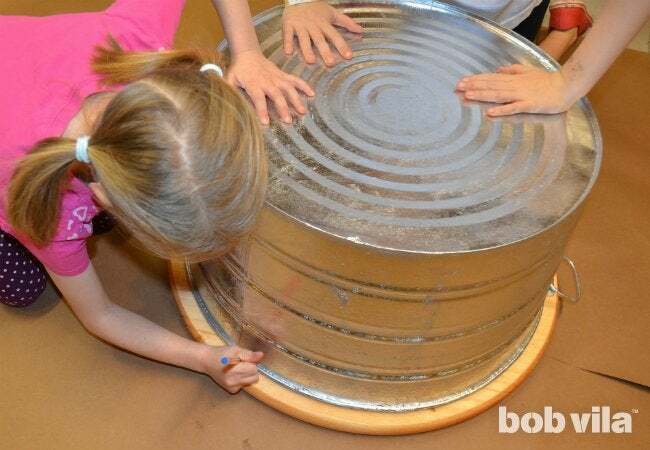 Drill a hole at each mark and attach the legs by placing a washer on either side of the tin and tightening a nut on top (inside the tub) with a wrench. 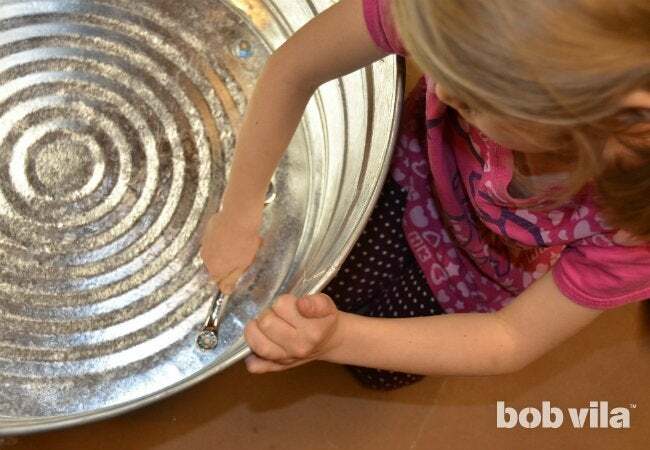 The metal of a galvanized tin tub is quite thin and has some natural flex to it. If you put legs on your table, there will be a little play and sway in it. It’s not a concern for storage of items like stuffed animals, blankets, and board games, but the table shouldn’t be used as a spare seat. If you need your table to be more stable, opt for bun feet, which are shorter, or skip the legs altogether. 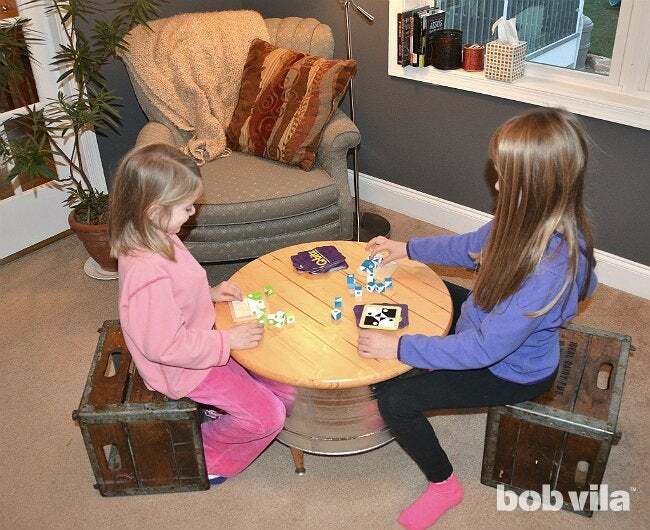 Replace the lid, and your table is complete! Even though it’s used to store toys, it looks rather grown-up. No casual bystander would ever know it’s stuffed with plush animals, kids’ games, and the like—which makes it perfect for hiding scattered toys minutes before you get a surprise visit from a neighbor. In fact, building this will make your kids so proud, they might even be excited to put their own toys away after a day of play.